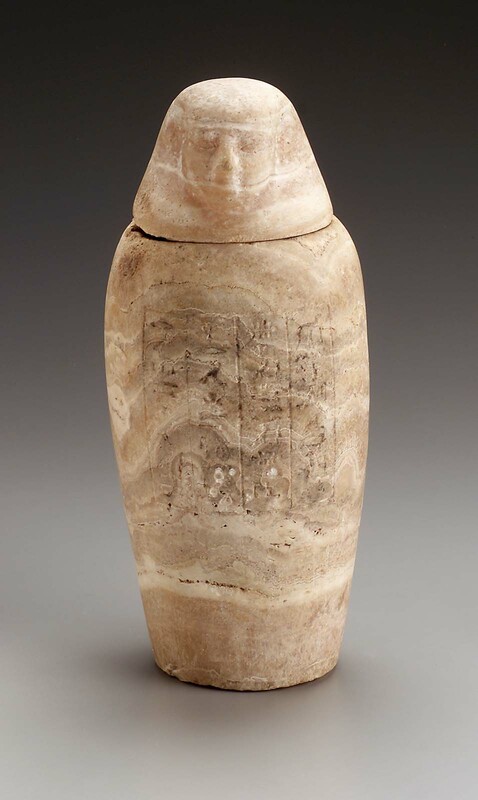 This canopic jar and lid are part of a complete set (4). They are carved of yellow to white travertine (Egyptian alabaster) with generally horizontal white veining. The sides of the jar are slighly convex with no formal shoulders and the widest part just above the middle. The lid is shaped as a human head, which customarily represents Imsety, one of the Four Sons of Horus, protectors of the viscera of the deceased. Facial features are not extensively modeled, blocked into the stone a muted, summary manner. On the front of the jar is an incised hieroglyphic text arranged in four columns within a rectangular register with divider lines. Traces of paint suggest the signs were once filled with black. The jar’s interior contains the dried residue of unguents. protect Hapy, who is in me. The whole set to which this jar belongs is comprised of object numbers 29.1133a-b to 29.1136a-b. Note: A jar with an inscription that mentions Hapy would often be expected to partner with a lid in the shape of a baboon head, which is preseved with this set but has been associated rather with another jar (29.1135a-b). This may be the result of ancient confusion or an incorrect joining of lids and jars in modern times. From Giza, G 7524 A. 1929: excavated by the Harvard University–Boston Museum of Fine Arts Expedition; assigned to the MFA in the division of finds by the government of Egypt.